. . . There is not a doubt in my mind that the Lancaster, the B17 and the B24 were built for the purpose of inflicting massive civilian casualties on the German populace. It was, in my opinion, one the greatest war crimes ever perpetrated. Colonel Robin Olds, surely one of the finest officers and fighter pilots ever to serve in the USAF, stated more than once that the so-called strategic bombing program was ineffective, wasteful and pointless. The eighth air force lost 80,000 men killed in the skies of Europe. And, the futility of the so-called strategic bombing program was illustrated very clearly by the fact that Germany reached its highest point of war material production in the last months of the war. Colonel Olds was of the opinion, widely shared I might add, that fighter bombers carrying a single bomb flying low and fast would have been far more effective against German military and strategic targets. civilian casualties. His career suffered because of his outspoken criticism. I suspect that he knew the real reason for the so-called "strategic bombing." It is was GENOCIDE. Why does it always take 50+ years for truth to surface, and WHY does it usually come from outside this country? This is an awesome and humbling document. I shall circulate it to non rw people, and will continue to circulate it for years. Every time we find someone writing about the non-existent gas chambers, we should send them this. Present time - it should be pointed out to all, that this atrocity and even more is what the Jewish state have in store for Iranian civilians soon. 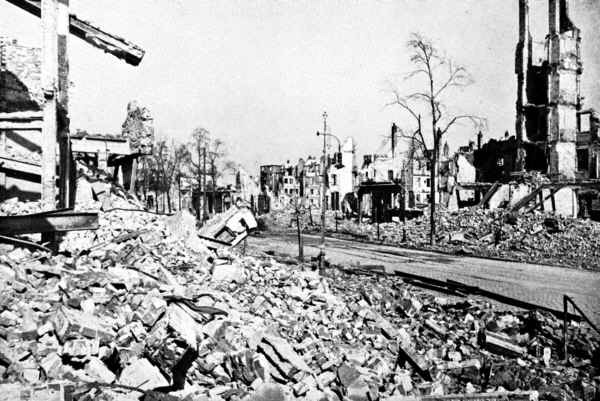 Between 1940 and 1945, sixty-one German cities with a total population of 25 millions were destroyed or devastated in a bombing campaign initiated by the British government. Destruction on this scale had no other purpose than the indiscriminate mass murder of as many German people as possible quite regardless of their civilian status. It led to retaliatory bombing resulting in 60,000 British dead and 86,000 injured. The British and the USA also bombed France, resulting in 60,000 civilian dead. 'It is one of the greatest triumphs of modern emotional engineering that, in spite of the plain facts of the case which could never be disguised or even materially distorted, the British public, throughout the Blitz Period (1940-1941), remained convinced that the entire responsibility for their sufferings rested on the German leaders.' Advance to Barbarism, F.J.P. Veale. 'Hitler only undertook the bombing of British civilian targets reluctantly three months after the RAF had commenced bombing German civilian targets. Hitler would have been willing at any time to stop the slaughter. Hitler was genuinely anxious to reach with Britain an agreement confining the action of aircraft to battle zones... Retaliation was certain if we carried the war into Germany... there was a reasonable possibility that our capital and industrial centres would not have been attacked if we had continued to refrain from attacking those of Germany... We began to bomb objectives on the German mainland before the Germans began to bomb objectives on the British mainland... Because we were doubtful about the psychological effect of propagandist distortion of the truth that it was we who started the strategic bombing offensive, we have shrunk from giving our great decision of May 11th, 1940, the publicity it deserves.' J.M. Spaight, CB, CBE, Principal Secretary to the Air Ministry, Bombing Vindicated. 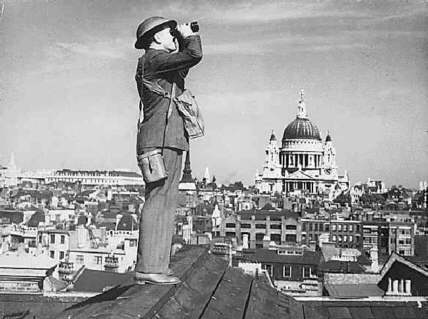 'The attack on the Ruhr was therefore an informal invitation to the Luftwaffe to bomb London. The primary purpose of these raids was to goad the Germans into undertaking reprisal raids of a similar character on Britain. Such raids would arouse intense indignation in Britain against Germany and so create a war psychosis without which it would be impossible to carry on a modern war.' The Royal Air Force, 1939-1945, The Fight at Odds, p. 122. Dennis Richards, Her Majesty's Stationery Office. The eminent British war historian and strategist Captain Sir Basil Liddell Hart declared that by this strategy victory had been achieved "through practising the most uncivilised means of warfare that the world had known since the Mongol invasions" (The Evolution of Warfare. 1946, p. 75).It was "absolutely contrary to international law" (Prime Minister Neville Chamberlain). 'The inhabitants of Coventry, for example, continued to imagine that their sufferings were due to the innate villainy of Adolf Hitler without a suspicion that a decision, splendid or otherwise, of the British War Cabinet, was the decisive factor in the case.' F.J.P. Veale, Advance to Barbarism, p. 169. 'I am in full agreement [with terror bombing]. I am all for the bombing of working class areas in German cities. I am a Cromwellian ­ I believe in "slaying in the name of the Lord!"' Sir Archibald Sinclair, Secretary for Air. 'They [the British Air Chiefs] argued that the desired result, of reducing German industrial production, would be more readily achieved if the homes of the workers in the factories were destroyed; if the workers were kept busy arranging for the burial of their wives and children, output might reasonably be expected to fall... It was concentrated on working class houses because, as Professor Lindemann maintained, a higher percentage of bloodshed per ton of explosives dropped could be expected from bombing houses built close together, rather than by bombing higher class houses surrounded by gardens.' Advance to Barbarism, F.J.P. Veale. 'One of the most unhealthy features of the bombing offensive was that the War Cabinet ­ and in particular the Secretary for Air, Archibald Sinclair (now Lord Thurso), felt it necessary to repudiate publicly the orders which they themselves had given to Bomber Command.' R.H.S. Crossman, MP, Labour Minister of Housing. Sunday Telegraph, 1 October 1961. 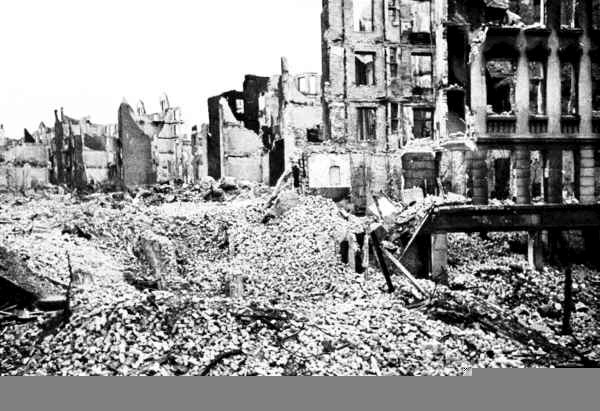 By weight, more bombs were dropped on the city of Berlin than were released on the whole of Great Britain during the entire war. 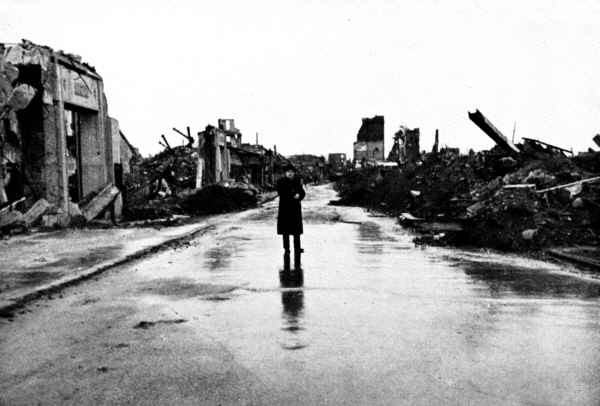 All German towns and cities above 50,000 population were from 50% to 80% destroyed. Hamburg was totally destroyed and 70,000 civilians died in the most appalling circumstances whilst Cologne was likewise turned into a moon-scape. As Hamburg burned the winds feeding the three mile high flames reached twice hurricane speed to exceed 150 miles per hour. Trees three feet in diameter on the outskirts of the city were sucked from the ground by the supernatural forces of these winds and hurled miles into the city-inferno, as were vehicles, men, women and children. 'What we want to do in addition to the horrors of fire is to bring the masonry crashing down on the Boche, to kill Boche and to terrify Boche' 'Bomber' Butch Harris, quoted in the Sunday Times, 10 January 1993. The strafing of columns of refugees by both American and British fighter planes was par for the course: "it is said that these [zoo] animals and terrified groups of refugees were machine-gunned as they tried to escape across the Grosser Garten by low-flying planes and that many bodies riddled by bullets were found later in this park" (Der Tod von Dresden, Axel Rodenberger, 25 February 1951). In Dresden, "even the huddled remnants of a children's' choir were machine-gunned in a street bordering a park" (David Irving, The Destruction of Dresden). "I think we shall live to rue the day we did this, and that it [the bombing of Dresden] will stand for all time as a blot on our escutcheon" (Richard Stokes, M.P.). '... the long suppressed story of the worst massacre in the history of the world. 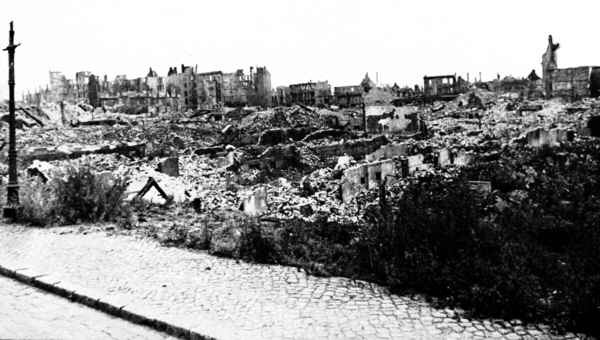 The devastation of Dresden in February, 1945, was one of those crimes against humanity whose authors would have been arraigned at Nuremberg if that court had not been perverted. Rt. Hon. Richard. H.S. Crossman, MP, Labour Government Minister. 'Its horror is revealed in the howling and raging of the firestorms, the hellish noise of exploding bombs and the death cries of martyred human beings as well as the big silence after the raids. Speech is impotent to portray the measure of the horror, which shook the people for ten days and nights and the traces of which were written indelibly on the face of the city and its inhabitants. No flight of imagination will ever succeed in measuring and describing the gruesome scenes of horror in the many buried air shelters. Posterity can only bow its head in honour of the fate of these innocents, sacrificed by the murderous lust of a sadistic enemy.' The Police President of Hamburg. 'Three-hundred times as many people died in Hamburg during the ten-day blitz as died in Coventry during the entire course of the war... Not even Hiroshima and Nagasaki, suffering the smashing blows of nuclear explosions, could match the utter hell of Hamburg.' Martin Caidin, The Night Hamburg Died, Ballantyne Books, NY, 1960. 'Of the children these dreadful nights, what can be said? Their fright became horror and then panic when their tiny minds became capable of grasping the fact that their parents could no longer help them in their distress. They lost their reason and an overwhelming terror took over. Their world had become the shrieking centre of an erupting volcano from which there could be no physical escape. Nothing that hell offered could be feared more. 'By the hand of man they became creatures, human in form but not in mind. Strangled noises hissed from them as they staggered pitifully through the streets in which tar and asphalt ran as streams. Some of these tiny creatures ran several hundred feet. Others managed only twenty, maybe ten feet. Their shoes caught fire and then their feet. The lower parts of their legs became flickering sticks of flame. Here were Joans of Arcs... thousands of them. All who had perished unjustly on the fires of the Middle Ages were as nothing when compared with what was happening that night. 'The sounds of many were unintelligible and undoubtedly many more called for their parents from whom they were parted by death or by accident. They grasped their tortured limbs, their tiny burning legs until they were no longer able to stand or run. And then they would crash to the ground where they would writhe in the bubbling tar until death released them from their physical misery.' Martin Caidin. 'Men, women and children too, ran hysterically, falling and stumbling, getting up, tripping and falling again, rolling over and over. Most of them managed to regain their feet and made it to the water. But many of them never made it and were left behind, their feet drumming in blinding pain on the overheated pavements amidst the rubble, until there came one last convulsing shudder from the smoking "thing" on the ground, and then no further movement.' Martin Caidin, The Night Hamburg Died. 'Phosphorous burns were not infrequent.' U.S. Strategic Bombing Survey. 'Phosphorous was used "because of its demonstrated ability to depress the morale of the Germans."' Official British source. From Michael Walsh, Witness to History, Historical Review Press 1996. Edited, with additions marked * by the National Journal. Photographs from Victor Gollancz, In Darkest Germany, Victor Gollancz Ltd, London 1947.